Turn on the oven to 400 degrees. 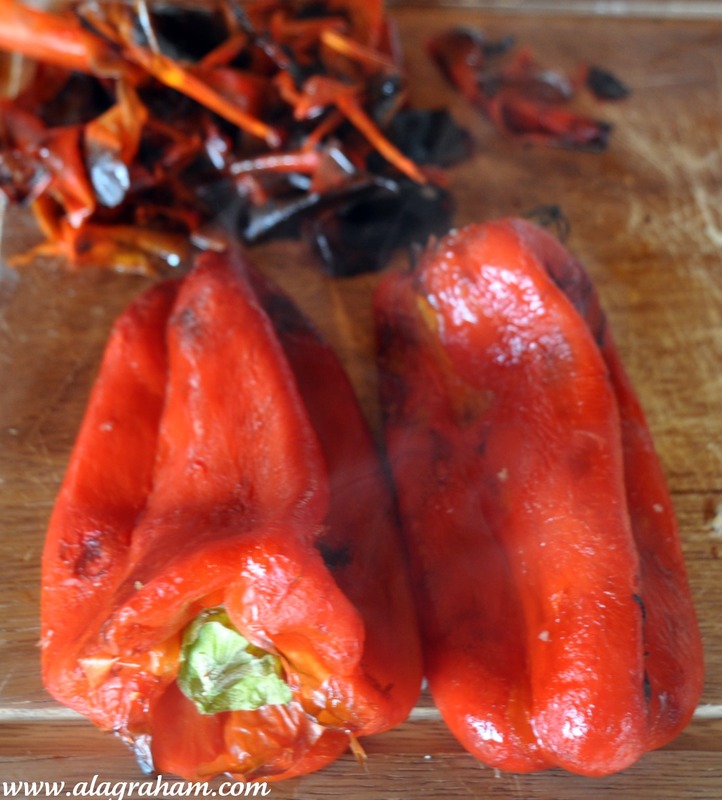 Place clean peppers in baking pan. Roast, turning occasionally until the skins are charred and the peppers collapse. and then remove seeds and set aside. In a skillet or pot over medium heat, drizzle in olive oil. Add diced onions and garlic and cook until soft, season with salt and pepper. Pour sauteed onions, garlic and the roasted peppers into a food processor and puree until desired consistency. Taste for flavor and add more salt or pepper if desired. Set aside. You can do this the night before and keep the noodles covered in the fridge. I prefer using a lemon zester but you can use a julienne peeler or a mandolin or even a knife if you have a lot of time a patience! Start at one end of the zucchini and use your zester to peel to the other end. Rotate around the zucchini and stop when you hit the seeds. You will end up with a pile of zucchini noodles. Add a little oil to a medium-hot pan and saute for about 2 minutes or more if they are thicker. But don't over cook or they will be soggy. Set aside. Peel and devein the shrimp, Add a little oil a medium-hot pan and saute for about 1-2 minutes per side or until the shrimp are pink. Do not over cook or they will be rubbery. Put the red pepper sauce on the plate. Add some spinach leaves on top (optional) or basil leaves may be nice for color. Toss the zucchini noodles with the red pepper sauce. Set a round mold (I use a biscuit cutter) on top of the spinach and fill with the noodles. Add the the shrimp on top and carefully slide the mold off. love your appreciation of nature & family too. keep it up!